Most people are willing to be poked and prodded if it means determining which mixture of chemicals kills colon cancer cells more efficiently, or identifying a rare genetic mutation that could prevent debilitating neurological conditions. But, in the end, very few sign up to participate in research. Whether that reluctance stems from a fear their genetic material will be stored and reused (often it is) or shared with scientists from other countries (rarely, if ever), many patients simply opt out of donating their time and blood or tissue samples to further scientific inquiry. Engaging patients — explaining secondary use of biospecimens, for example — can shift the paradigm. 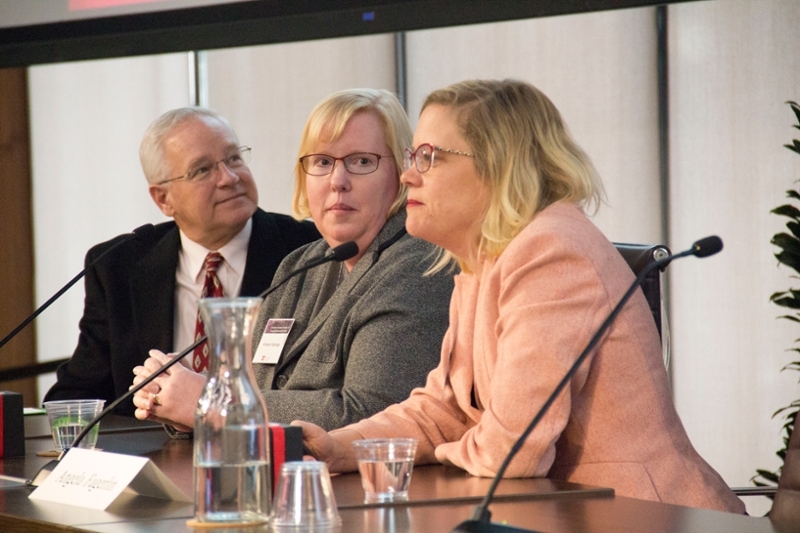 But interacting with patients in that way is a fairly new concept when it comes to clinical trials and informed consent, says Jeff Botkin, M.D., chief of the University of Utah School of Medicine’s Division of Medical Ethics, speaking at the second Frontiers in Precision Medicine conference at the S.J. Quinney College of Law Thursday. Several health care systems have managed to build large research cohorts over time, including the Veterans Administration and Kaiser Permanente’s Division of Research. The VA is building a 1-million-patient cohort, genotyping blood samples to study links between schizophrenia and bipolar disorder, and post-traumatic stress disorder. Just over 500,000 veterans have signed consent forms and allowed their blood to be sampled, says Laurence Meyer, M.D., a University of Utah dermatologist who works with the VA in Salt Lake City. About 200,000 of the samples have been genotyped. Persuading veterans to participate wasn’t hard, Meyer says. While early focus groups and surveys showed two-thirds of VA patients figured they would be “guinea pigs,” and more than half thought the results might be used against them, 71 percent said they would participate and 83 percent said the genetic mapping should be done. Kaiser Permanente also has a nearly-built-in research cohort in its patients rolls. Starting in 2007, the insurance company mailed a survey to adult patients in northern California, asking them to sign consent forms and send in saliva samples for a study of exposures to environmental pollutants and other hazards and their impact on patients’ health. About 200,000 have signed on for blood sampling. Kaiser has established a community advisory board, a scientific advisory panel and a bioethics panel to oversee the entire project, says Catherine Schaefer, director of the company’s Research Program on Genes, Environment and Health. “You’re creating this [research cohort] within the context of a health care provider,” Schaefer says. “We have a long-term relationship with our members that is multi-faceted. We wanted to make sure to do it right.” In the end, over 80 percent of the cohort’s participants have opted in a second time, signing consent forms for further study. Still, Schaefer acknowledges, there are shortcomings, even with Kaiser’s pool of patients. Despite being based in a diverse region, the cohort is less representative than the surrounding population — just 3.4 percent are African American, while 81 percent are white. And just over half of the patients involved are between 60 and 79 years old. Just 6 percent of participants are between 18 and 39 years old. “Young men in particular seem to have better things to do than complete questionnaires and spit in containers,” Schaefer says. Researchers are going to have to get creative, she adds, tailoring their message for younger patients who are used to communicating on different platforms and motivated to participate in research for different reasons — altruism, or contributing to their community, for example. Even once patients sign on to a study, the work of engagement doesn’t end there. Researchers have to gauge patients’ level of health literacy — and even their own. The education process — for both patients and providers — goes well beyond informed consent, adds Kimberly Kaphingst, Sc.D., a communications professor and investigator with Huntsman Cancer Institute. “We know there are major gaps in what people understand, even after they complete the informed consent process,” Kaphingst says. Just 1 percent of Americans without a high school diploma are considered proficient at processing health information. At the same time, that number increases to just 13 percent of those with graduate degrees. Doctors still struggle to understand and explain complex medical information, she says.